So my blog has been very music orientated of late so I decided to write about one of my favourite series of novels. Most people are familiar with Anne of Green Gables, after all there have been three movies based on it. But many don’t realise that there are 10 books in the series. I ‘inherited’ them from my Mum. By inherited I mean, I took them with me when I moved out and she’s resigned herself to the fact that she’s not going to get them back. And that’s mostly because I loved them as a child, and I still love them. I probably read Anne of Green Gables first when I was about 10 or 11. I was an avid bookworm who would read anything that I could. I spent hours imagining characters to come to life. So a story about a 12 year old orphan girl (orphans always fascinated me for some reason), who has an over-active imagination, and goes to one of (what I still imagine) the most beautiful places, really resonated with me. I was enthralled by this red head girl with a temper, and who insisted her name be spelt correctly. As a child with a fairly common name but my parents used the biblical spelling, I used to spell my name out too. And was always a little too proud about it being different and unique. So I identified with some aspects of the character. And then as I grew up I could read and understand more of the older books. At first I didn’t read them all in sequence. I can remember being bored by Anne of Avonlea, I mean what 14 year old wants to read about a newly married couple. I didn’t understand all that. And even later I can remember reading Rilla of Ingleside. As a 16 year old (i’m guessing here), again I didn’t really understand the subtext of the novel. But now it’s one of my favourite novels. The story of Anne and Gilbert enchanted me. And the series always satisfied my thirst to know what happened next. Too many romance novels just leave it at ‘happily ever after’ or ‘they’ve just met the person they were destined to be with at the beginning of the novel so we’ll leave it at that’. The Anne series let me know what had happened next. These novels are so rich and full of detail, and yet they never seem bogged down or slow. But I never get the feeling that life was always constant excitement. They made the little things become the narrative. The little, ordinary, day to day things. And that’s what I took away from these novels. Not everything in life has to be an adventure to write about it. The little things can be the adventure too. And they are the adventure. And that’s why I write my adventure. My day to day trivial things that happen, my feelings, my emotions, my experiences whether they be through clothing, food, music, books, or even (heaven forbid) real life. The Anne Series has become a set of books that I can pick up depending on where I’m feeling. Some days I will be that little 12 year old girl, in a new and exciting place, searching for acceptance. Some days I will be the teen who’s moving on to a new chapter in her life, trying to figure out where she’s going. Some times I feel like reliving the adventure that is moving out into your first place and trying to run a household. And then there are the times where I need to read about the happily married, the kids, the joys, and the heartbreak. And when I’m in none of those moods, that’s when I read Rilla. Her story is one of war, heartbreak, love, loss, and growing up. And it is a standalone story which means I won’t feel inclined to read the rest of them in one hit. I love these novels. They are a part of my home and my life. And it wouldn’t be the same without them. 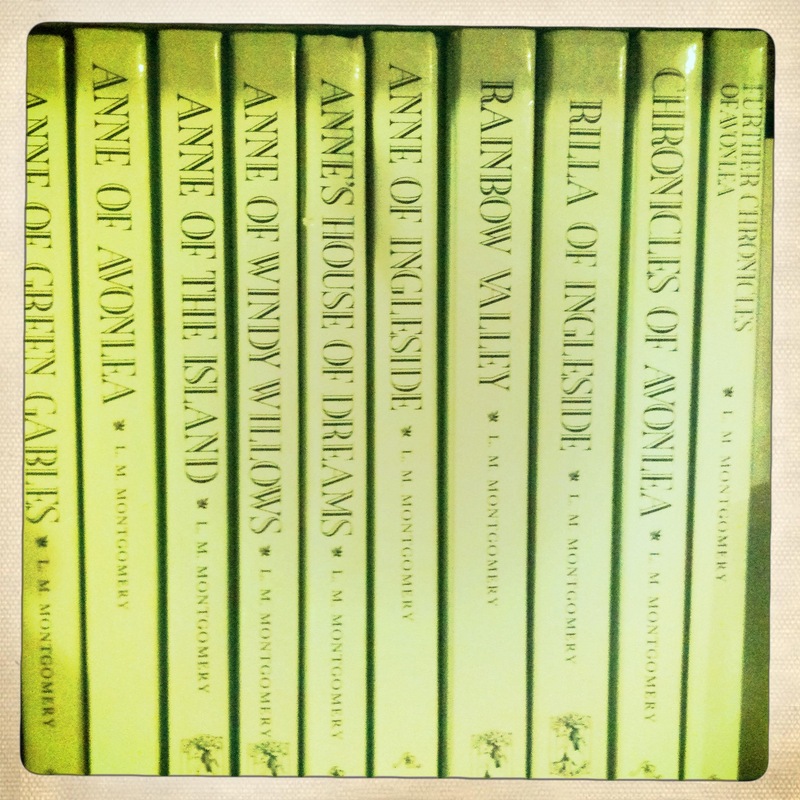 Um, this is pretty much my favorite series of ALL TIME (plus the Chronicles of Narnia.) SOUL SISTERS. I loved the chronicles of narnia!!! I had a book crush on prince caspian. I haven’t re-read that series in ages. Are you on twitter? I feel like we could have magical twitter fun times together. I’m not currently, but I’m considering it. Just don’t tell my husband- he thinks it’s super lame. Yup my bloke thinks it’s horrible. But I’m always curious about what people think about topics and so I love it. Plus I’ve made friends I wouldn’t have otherwise. I get most of my news from it now. Maybe our doods should be friends then too, ha! Probably. They can be grouchy about twitter together. The only thing he uses the Internet for is looking at videos of people hurting themselves or catching fish. Everything else is stupid. Hey, I joined twitter and followed you! I don’t know what to do next. Twitter is hard.